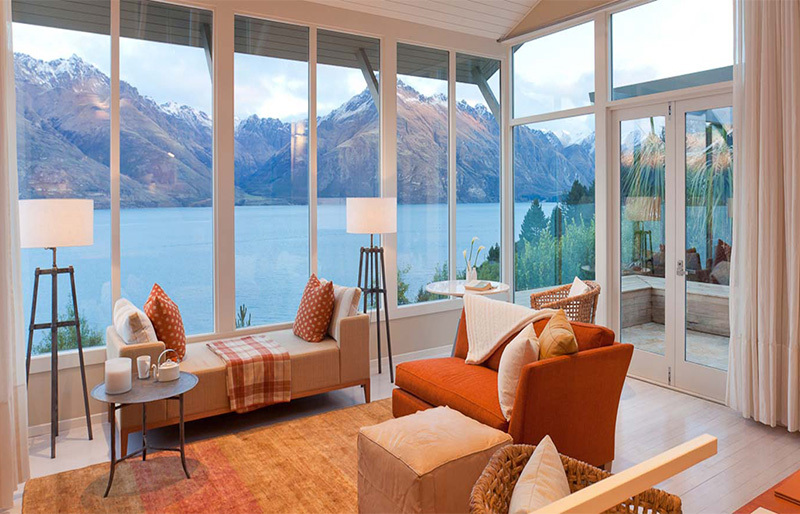 Just seven minutes from bustling Queenstown, this is an alpine lakeside retreat, set in one of the world’s most strikingly beautiful landscapes. With clean lines in glass, stone and timber, Matakauri’s own take on luxury is understated and welcoming; embracing guests and championing the mountainscape. Four suites are located within the main lodge, with the remaining suites nestled on the banks of Lake Wakatipu overlooking the mountains. These are all styled by acclaimed interior designer Virginia Fisher, who gives the rooms an authentic connection with the vast, inspiring mountains that envelop the lodge.Spectacularly located on the shores of Lake Wakatipu, Matakauri Lodge looks out on a mesmerising panorama of the big three New Zealand mountains: The Remarkables, Cecil and Walter Peak. From this base, you can set out on an incredible array of adventurous activities. These include teeing off on top of Cecil Peak, heli-skiing, private cruises, mountain biking, and more. For those who prefer something more sedate, gentler adventures are on offer, such as the Southern Lakes Art and Wine Tour. This is a great way to learn about the resurgent New Zealand wine market and experience native art unlike anything else. Fortunately, after a long day, there’s also ample opportunity to relax in one of the restaurants or the on-site spa. The restaurant provides New Zealand food with a focus on sustainability and local produce. It’s all sourced from the Central Otago Region, meaning the freshness of the mountain air is matched by the freshness of the food. The Matakauri spa has two treatment rooms, each with private deck surrounded by gorgeous Kiwi flora. With these features, and plenty of support for the whole family, the Matakauri Lodge is one of the world’s best adventure resorts.